You are here: Home / A-Blog / Taxpayers Could See Benefits From GOP Tax Bill as Early as February. Taxpayers could see the benefits from Republicans’ tax reform as early as February, one tax expert says. “Certainly early next year, February probably, businesses will start deducting less from employees’ paychecks, and so there you will see a benefit, you will have higher take-home income when your employer is sending less of your money to Washington,” Adam Michel, policy analyst for economic studies at The Heritage Foundation, told The Daily Signal in a phone interview. In a final 224-201 Wednesday vote, the House sent the bill to President Donald Trump’s desk for his signature. Historic tax cuts are on their way to the President's desk. Trump has made passing tax reform a major goal of his first year in office. Michel said he expects businesses to see the benefits from tax reform in the next year. “Businesses will start adding more jobs and investing more in the United States immediately, and those effects, we will probably be able to see them in the data within a year, and they’ll probably be fully materialized over the course of the following several years, but the indicators will start trending up within 12 months or so, I would presume,” Michel said. But if you’re ready for a simpler tax code, you’ll have to wait for filing in 2019. The final tax reform bill maintains the current number of brackets, seven, but lowers the rates to 10, 12, 22, 24, 32, 35, and 37 percent. It caps the state and local tax deduction, which allows taxpayers who itemize instead of taking the standard deduction to deduct from their federal taxable income any property and income taxes paid to state or local governments, at $10,000. 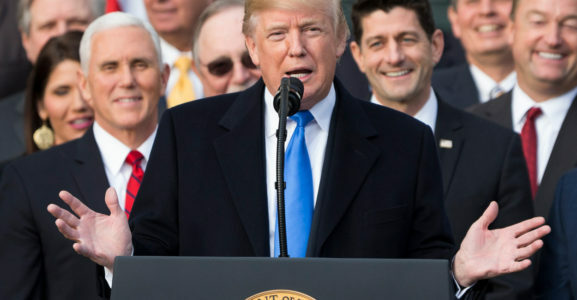 The bill repeals Obamacare’s individual mandate, and also increases the current $1,000 child tax credit to $2,000 and gives a $500 credit for non-minor child dependents. The legislation reduces the federal corporate tax rate from 35 percent to 21 percent and repeals the corporate alternative minimum tax but leaves in place the individual alternative minimum tax and increases the exemption. Support for the new Republican tax law has increasingly grown in recent days, with the office of Senate Majority Leader Mitch McConnell, R-Ky., sending out an updated list Tuesday night of 255 groups who have expressed support for Republicans’ tax reform. The list, originally released Dec. 1, includes household names such as Allstate Insurance, American Airlines, Best Buy, Comcast, Delta Airlines, FedEx, Ford Motor Co., Home Depot, Target, and Verizon. Following the House’s Wednesday vote, AT&T announced it would give a special $1,000 bonus to over 200,000 AT&T U.S. employees. The last time Congress updated the tax code was in 1986, with President Ronald Reagan’s Tax Reform Act.